Being a marine biologist by education I am fascinated by the diverse colors and forms of marine organisms. My work in Southern Thailand as a field manager in a co-funded project for coastal habitats and resources management (CHARM project), funded by the Royal Thai Government and the European Union, allowed me to observe Thailand's various marine resources. It is only a small step to come up with the idea to combine the beauty of these marine products with traditional Thai art to produce such mother-of-pearl inlaid cabinet. This technique is uniquely Thai and has been used and cultivated in Thailand for centuries. I hope that with the team of highly skilled craftsmen and artisans joining in this project the resulting cabinet will allow me to keep some of the secrets in Thai art. "When visiting Jitdra Thanee's web page for the first time I was fascinated by the way he has developed traditional Thai painting. Inspired by old myths, stories and religious scenes Jitdra Thanee has found a way of preserving the traditional style of Thai painting and combined it with new elements and new ways of expression. Although still young he has already proven his skills in several projects and competitions." "I asked Jitdra Thanee to take the lead in the preparation of this mother-of-pearl inlaid cabinet because his ideas for the design will not only provide a lively scene for the cabinet but will also prove that traditional Thai art is still up-to-date. 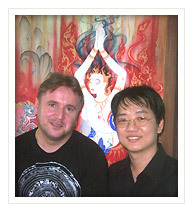 This web page is an other example for his ideas and vision of "modern" traditional Thai art. And Jitdra Thanee still has a lot of stories to tell." I believe that art is universal and art is beyond races. When a piece of work is created with full of artistic skills, despite without any literal explanation, that piece of work will be able to attract people’s attention. Anybody who has seen a good piece of work will be able to directly communicate with the artist’s mind. It is as if he or she is listening to a story of that artist’s life through his work. No matter how long the time has gone, the artist’s spirit still remains in his piece of work. I sincerely hope that this special piece of work, a mother-of-pearl inlaid cabinet, will be interesting to anybody who appreciates in Thai mother-of-pearl inlaid work. I will also be grateful, if this piece of work can show the beauty of traditional Thai art to the world community.